Brave marks a series of creative firsts for Pixar Animation — it’s their first fairy tale story AND it’s their first female main character. If they had screwed it up, their entry into the arena already perfected by parent company Disney might be possible to forgive since it was their first time in so many ways. But that’s a moot point. They didn’t screw it up. Not even close. Brave is just the latest example of Pixar’s ability to outdo themselves. Visually, it’s a wonder, as the animation sweeps you into a facsimile of the Scottish Highlands so breathtaking and majestic that you’ll be wanting to book a trip across the pond the moment you leave the theater to see the real locations in order to compare. Story-wise, the film has just enough surprises to make it a different kind of “princess” tale, and will keep even Disney devotees guessing at its plot turns even as it honors those most hallowed conventions of the Disney formula. If you’ve been out to the Disney parks lately, in particular the Magic Kingdom, then you probably already know a little about Brave‘s story and heroine, as the theme park folks have been doing their part to acquaint guests with their newest princess. Merida (voiced by Scottish actress Kelly Macdonald) is the young, free-spirited daughter of King Fergus (Billy Connolly) and Queen Elinor (Emma Thompson), who wants nothing to do with her mother’s grooming her to be a proper princess and a future queen. She lives for the rare days she can escape on the back of her faithful Scottish Clydesdale, Angus, practice her archery, and climb the heights of her native lands in order to “touch the sky.” When the time comes for the family to honor tradition by having Merida betrothed to a son of one of Fergus’s allied clan lords, Merida fears that any chance for her to live her own life might be slipping away. In her attempt to turn tradition on its ear in order to change her fate, Merida sets events in motion that will put all of her lessons, including those unwillingly learned from her parents, to the ultimate test, and along the way redefine for her the meaning of bravery. It’s a deceptively simple set-up for a story, one that you might read and say to yourself, “Oh, we’ve seen Disney do this before.” If you did say that yourself, you’d be at least partly wrong, because in the strictly visual sense, I daresay you have never seen anything like this. Everything about Brave‘s visuals, from its lush landscapes to its meticulously detailed costumes, weapons, castles, and characters, comes alive in a way that has to be seen to be believed. The land itself is as much a character in the story as any of the humans or animals in the sense that everyone and everything is touched by this unique place and time. Additionally, this is one film that truly benefits from being seen in 3D, as the stunning work of the animators is made more vibrant and more immersive than anything Pixar has ever produced. 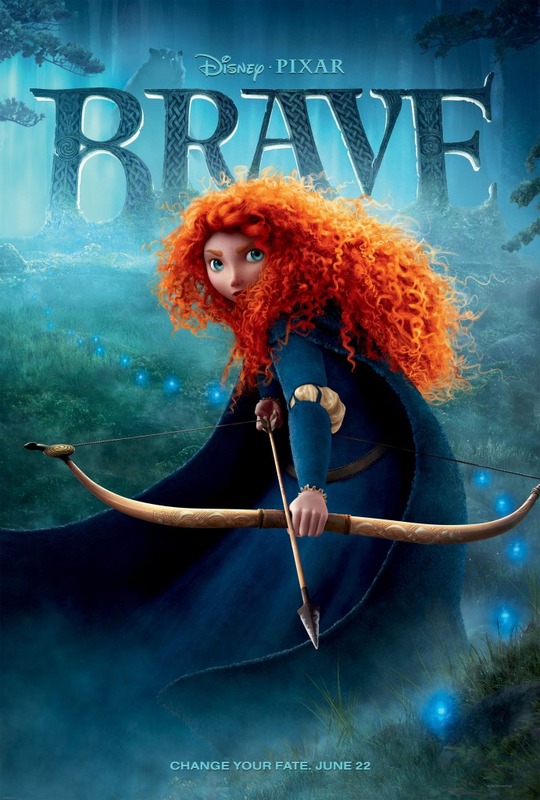 Don’t be surprised when this film takes the Oscar next year for Best Animated Feature, because nothing else this year has even come close to what you will see in Brave’s 94 minute running time. In terms of its characters and story, directors Mark Andrews and Brenda Chapman give us more than just another Disney princess tale. They show us a family in a situation that today’s parents, in particular mothers, can easily relate to: having to somehow corral the bright, strong, willful child they raised who wishes to find his or her own way, regardless of what’s already expected of them. Similarly, tweens and teens should readily connect with Merida, not just for her strength and fiery spirit, but also for her lament as she yearns to be free from what others have decided for her. Even as she makes her fateful choice and allows magic a chance to create chaos in her peaceful home (even though we know it’s the selfishness of a child at work behind that choice) we can’t wholly blame her for it. We’ve all been there at some point. In case you had any doubts, yes, there is a happy ending (this IS a Disney movie, after all), and the worst of all consequences for Merida’s attempt at changing her fate are avoided. In that sense, yes, Brave is perhaps a bit too conventional. But how you get to that ending, and Merida’s coming-of-age journey in and of itself, has just enough uniqueness and charm to set itself apart from the rest of Disney’s fairy tales. It is also a bit more intense in terms of its scares – the ‘PG’ rating is well earned here, so parents should take that into account when bringing anyone under the age of 6. But for everyone else, this is a tale of tremendous heart and relentless beauty, one that may demand repeated viewings, if only just to return to that incredible place if you can’t afford a trip over to the real Scotland. Mothers out there, go with your daughters, young or not-so-young, to see this one, and don’t be surprised if you find yourself getting a little misty right before the end credits roll. Yup, it might just hit that close to home. Featuring the voice talents of Kelly Macdonald, Billy Connolly, Emma Thompson, Julie Walters, Robbie Coltrane, Kevin McKidd, Craig Ferguson, and directed by Mark Andrews and Brenda Chapman. Rated PG For some scary action and rude humor.